Edited by Edward Fitzgibbon this is a scarce title, subtitled 'A True Treatise on the Art of Fly-Fishing, Trolling etc., as practised on the Dove, and on the Principal Streams of the Midland Counties; Applicable To Every Trout And Grayling River In The Empire.' It commences with a rather gushing dedication to Sir William Boothby BART. of Ashborne Hall Derbyshire and to David Watts Russell of Ilam Hall Staffordshire, who appear to be the financiers of this work and then with a long list of the great and the good of the day who had ordered more than one copy. The book begins with two chapters in praise of fly fishing and then goes into the technicalities of rod and tackle, the habits of the quarry and how best to fish for them. 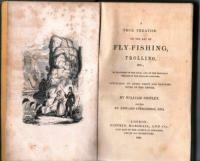 Generally a flowery book but in its day a creditable all-round approach to fly fishing. Tightly bound the corners are bumped and there is a small corner of one of the endpapers missing. In embossed green cloth with gilt titles to the spine and lovely illustrations this is a fine collector's item.